Capacity expansion. This is the no-brainer for expanding. MDG was reaching 75% of our capacity, so we either had to expand or recognize there would be a future cap on what we could offer to our customers. With internal goals already in place to increase the reach of our offerings by 2020, we realized expanding was our best option. Reliability via redundancy. When you visit MDG you will see a very deliberate and intentional attempt at redundancy. To be reliable day in and day out, redundancy in equipment is vital. Let’s face it, equipment breaks down from time to time, but we don’t want our customers to have to suffer. At MDG, we have focused on setting up a model where we have multiple fermentors, centrifuges, freeze dryers, boilers, air compressors, chillers and sterilizers to back up our promise to deliver. We have a backup generator in place to guard against brown outs in electrical utility supply. We also offer redundancy in location, allowing for the storage of our culture inventory in one location, with our ability to produce in the other fermentation location. This provides protection in case of a fire or another form of disaster at one location or the other. When you sign these long-term contracts, not delivering isn’t an option. Rapid production of 50+ strains. This is our niche. We are the grower. 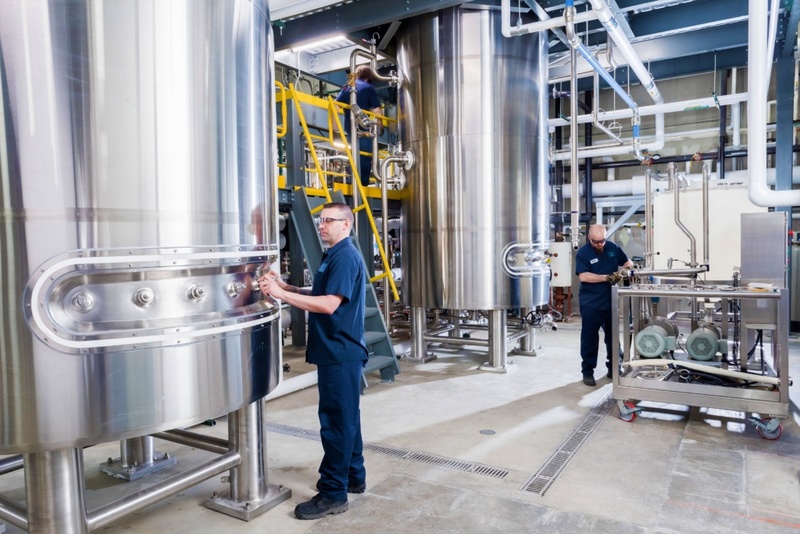 While many companies have one large fermentor, they will often limit themselves to producing 1 or 2 strains. For economy of scale and for avoiding frequent contamination, keeping the number of strains produced low makes a lot of sense. However, we found our clientele often need 5-7 strains each and if you get enough of these customers, quickly you have the need to produce 50+ strains per year. The company with one large fermentor won’t have the capacity to do this. Our design includes 3 medium sized fermentors and a plan for a fourth. There is an additional advantage to this plan, the small to medium tanks have better oxygen transfer so we can get higher yields then seen in these large fermentors. Our customers appreciate the yield to scale ratio that we have been able to provide, combined with the ability to produce so many different strains for them in a short amount of time. Some of the large companies have come to us hoping we could serve as a “tweener” or a large pilot stage for them. Discovering our yields allowed them to go much further into their long-term projections without a need to go bigger. Either way, MDG can serve a lot of needs. The expanding Bacillus market. I’m not sure if you have been watching, but not only are our partners direct fed microbials and probiotics gaining more acceptance, but the human probiotic world is also taking notice that Bacillus are more stable then lactic acid bacteria, and more suited to long-term distribution and shelf life. Bacillus are a big part of this antibiotic alternative tsunami that is hitting the animal world; visit your local Walgreens or supermarket, you will see Bacillus is beginning to make its way to the human market. MDG’s current GMP and FSMA compliance, along with our current HAACP certification and future food ingredient certifications, will help insure our company will be a great partner to those serving the human probiotics business. Meanwhile, the plant biopesticide and fertilizer market continues to grow in strength. This forecasts for a strong decade for Bacillus production, especially for those who are willing to produce a high number of different Bacillus strains. So, as we designed our facility with 3 different fermentors, we have also created space for additional fermentation expansion to grow with market demand. When I first got into the Bacillus business, I used to worry about the competition. Now, instead of worrying about our competitors, I worry that all of us combined will not be able to keep up with the expanding Bacillus market. But with this new capacity, we believe we can do our fair share of production for the combined $6-10 Billion animal and plant markets and while starting to supply the $45 Billion human probiotic market. If you add in our new landfill plastic patent adventures, we see great things ahead. We are enthusiastic to continue to play a role in helping to Feed, Clean and Save the World.